In former days, Carnival festivities started with the ‘Parata’ on Carnival Saturday. 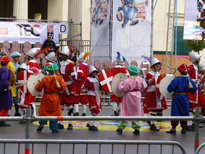 This consists of an ancient Maltese sword-dance which commemorates the Maltese victory over the Turks in 1565. It comprises of a company of young men or children dressed up in gay ribbons and armed with wooden swords. The dancers represent either Christian or Turkish soldiers. The members of the company form two concentric rings of an equal number of dancers representing the two different ‘armies’. The dance is directed by a leader who blows a whistle and strikes his own sword against the first one of the opposing group. The dancers of the outer ring start to move to the left three paces at a time, striking the sword of the dancers in the inner circle to the beat of a bass drum. While this is going on there would also be the playing of a violin and a bagpipe. When the dance reaches the end a girl who represents the ‘Għarusa tal-Parata’ (the bride of the Parata) is lifted shoulder-high. This young girl will be splendidly dressed up in a white dress and a red cloak – the colours of the national flag. She also carries a small dagger. She is carried around the square as a sign of the Christian victory. Under the Knights, the ‘Parata’ was considered to be a very serious activity. People eagerly awaited the performance of the dance. They knew quite well that if there was no ‘Parata’ there would be no Carnival. This created the need for the dancers to wait outside the Palace of the Grandmaster (today the Palace of the President) until they received permission for the celebration of Carnival. It was the custom for the Knight Grand Cross who had been last appointed to call on the Grand Master to remind him about this permission. When the request was granted then a ‘bandu’ proclaiming the opening of Carnival was immediately issued. Once the permission reached the dancers they would start to perform the dance on the Palace Square (Piazza San Giorgio). Similar dances were then performed in front of the houses of wealthy persons who were likely to pay the dancers for their trouble. During the times of the Knights, there was a custom of hanging a stone from the ‘Castellania’ or the Palace of Justice balcony (today the offices of the Medical and Health Ministry) as a sign that justice had been suspended for the three days of Carnival. It is recorded that in 1752 the Knight Grand Cross failed to appear before the Grand Master. The people started to protest but he was warned in time to make the amends by obtaining the Grand Master’s permission before any acts of violence could start.